Yamazaki Mazak is exhibiting five laser cutting machines and one machine tool at EuroBLECH 2014, the largest number of machines ever exhibited at the show by the company. Mazak’s 1,000 sq m stand will be themed ‘make [it] better’ and will demonstrate to visitors a ‘total solution’ for sheet metal cutting, combining both laser processing and machine tools. The ‘total solution’ will include the new OPTIPLEX NEXUS 3015 with a compact platform that has been specifically designed for new entrants into laser processing with limited production floor space. In addition, Mazak will be exhibiting a new OPTIPLEX machine with a larger cutting table which is available in both fibre and CO2 versions. The new OPTIPLEX 4020 Fiber machine combines an enlarged cutting table measuring 4,000mm x 2,000mm and a new cutting torch. The new torch, which has been manufactured by Mazak, is able to adjust laser beam size and is capable of generating a longer focal length. The machine is also equipped with an automatic nozzle changer and the specific machine being exhibited at EuroBLECH is also equipped with a flexible automation system. esses. The machine is equipped with a number of Intelligent Functions, including IMS, Intelligent Nozzle Changer which enables automatic nozzle changing within the programme and Intelligent Auto Focus Distance Measurement Adjustment. Also making its European debut will be the 2D Tube Gear 150, designed for efficient, high-speed tube and pipe laser cutting operations which require high levels of precision. The machine has been designed to optimise the cutting of square tubes, round tubes and pipes up to six inches in section size and is equipped with a three-chuck design which delivers superior precision, higher accuracy and significantly reduced vibration. 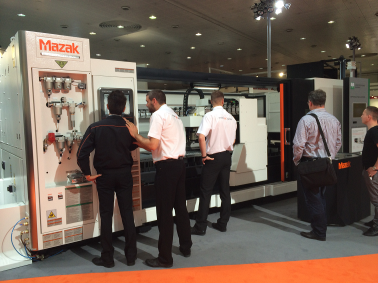 Alongside the laser cutting machines, Mazak will also demonstrate a VERTICAL CENTRE SMART 430A, vertical machining centre, complete with friction-stir welding capability, which enables the machine to mill, drill, weld and tap flat components. Gaetano Lo Guzzo, Laser Business Director for Mazak Europe, commented: “EuroBLECH 2014 gives us an opportunity to deliver on our promise to customers for new larger machines capable of handling bigger worksheets. The new OPTIPLEX 4020 model, available in both fiber and CO2 versions, complete our OPTIPLEX range of machines with an enhanced table size and a range of new features.